Lane is blindsided and her charmed and pampered existence uprooted, when her shattered husband, Micky Capello, breaks the devastating news: he’s lost the family fortune and is leaving on a quest to “find himself.” The most daunting part is they’re losing the nannies—and the children Lane barely knows will live with her. Without the leisure to wallow in misery and self-pity, Lane is catapulted into an adventure of a lifetime that’s filled with outlandish and often emotionally charged escapades of trial and error, all with her über supportive—albeit dysfunctional—family in tow. 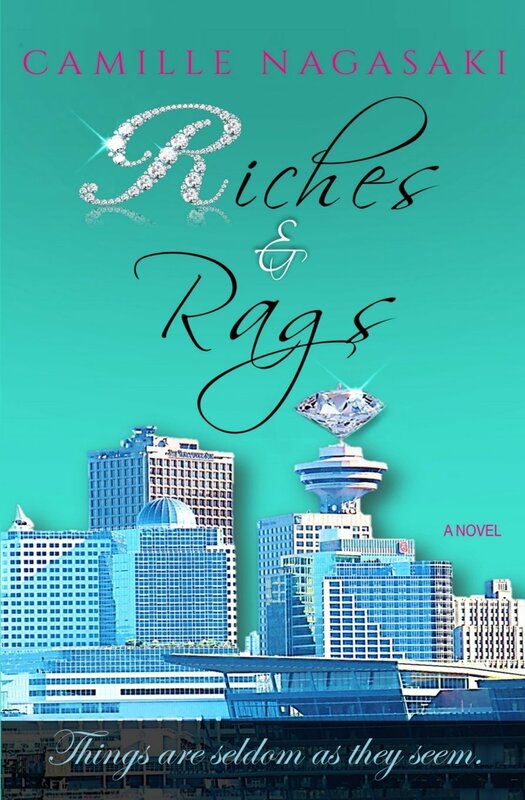 Some time ago I was contacted by author Camille Nagasaki who asked me whether I'd be interested in reading and reviewing her debut novel 'Riches and Rags.' The book looked like a promising chick lit read, and Camille was incredibly lovely to send me an actual paperback review copy to read (thanks again, Camille!). It had actually been a while since I had the chance to pick up an actual book instead of an e-book, so took the chance with both hands and looked forward to sitting down with a promising paperback in one hand and a warm cup of tea in the other...! Lane Carson has gotten quite used to her luxurious lifestyle thanks to her marriage to wealthy businessman Mickey. So when she discovers he has suddenly lost all of his money, she feels quite blind sided. This only gets worse when Mickey decides he needs some time alone to find himself, and Lane is left to take care of their two kids, without a home to live in and without any nannies or household staff to take care of them. Lane is forced to quickly skip the stages of misery and despair and be inventive in finding a place to live, earning money to buy groceries, and take care of her daughters at the same time. But after such an expensive and carefree lifestyle, will Lane be able to build up a new life or is it simply too much to deal with all by herself? When I picked up Camille Nagasaki's 'Riches and Rags' I was expecting an entertaining chick lit novel, based on its lovely cover and interesting blurb, and I'm glad to say that's exactly what I got. Camille's writing flows well and includes a good balance between dialogue and description, which was easy to get into and a style I personally really enjoyed. The novel focuses on main character Lane Carson, whose life is suddenly turned upside down when it turns out her husband has lost all his money. In the beginning Lane was incredibly stuck-up and spoiled and I have to admit I was kind of dreading reading a whole book with a character like that at its centre, but luckily that got a lot better as things went on in Lane's life and she's forced to change. While the plotline of the book is not the most original one, the author has managed to give it her own twist and with the help of numerous various characters and different situations it really is quite a great read. The book is about life choices, family, friendship and also has a nice dose of romance at its core, and I am sure many chick lit readers will enjoy reading this just like I did. I'm already excited to see what Camille Nagasaki will treat us to next and can't wait to read her next work. 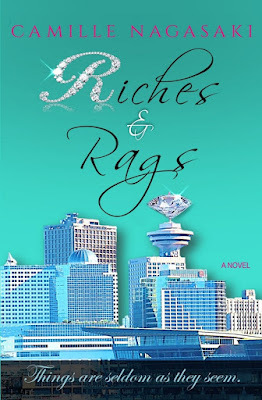 All in all, 'Riches and Rags' is a well-written and entertaining chick lit novel that I personally thoroughly enjoyed; a well done to Camille Nagasaki and I'm curious to see what she'll treat us to next! Thanks to the author for providing me with a review copy in exchange for an honest review. Welcome to 'A Spoonful of Happy Endings', a blog dedicated to (mainly) chick lit. On here you will find information about all kinds of novels; the newest releases, but also the classics. Blog Tour: 'The Dress' by Jane L. Rosen! Top Ten Tuesday: Top 10 Rom-Coms! Upcoming Release: 'The Dress' by Jane L. Rosen! Chicklit Club - Chick Lit reviews, news, author interviews, new releases, release dates and more. Laura's Book Reviews | Reviews about the books I love to read! All Images and Content © : A Spoonful of Happy Endings (unless otherwise stated).